"Who is it?" is achieved by integrating your OVP with marketing automation and interactivity to define the individual with whom you’re communicating. "What should we talk about?" combines video with interactivity and personalization to enable you to send the right content to the right person at the right time. "Can you hear me now?" 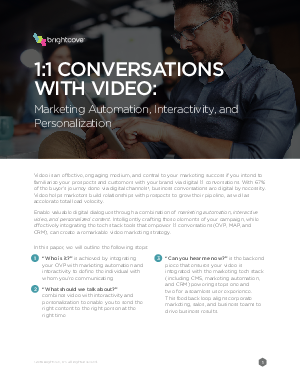 is the backend piece that ensures your video is integrated with the marketing tech stack (including CMS, marketing automation, and CRM) powering steps one and two for a seamless user experience. This feedback loop aligns corporate marketing, sales, and business teams to drive business results.